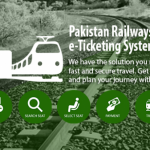 Pakistan Railways has launched the system of E-ticketing service for online ticket booking and seat reservation. The ministry of railways has taken this initiative to facilitate passengers in booking a seat for their travel by providing them services at the ease of doorstep made possible through internet. The e-ticketing service has been introduced in collaboration with UBL. Firstly, one has to access Pakistan Railways E-ticket Portal and then basic details like date, train, station of arrival and departure have to be provided and then search option is clicked. In the subsequent step, information regarding train departure, classes of tickets and fares and seat availability as per train selection will be provided to the user. In the last step, four minutes will be provided for payment of booked seats. Payment can be done via any Visa Card, MasterCard or by UBL Omni service. Initially, this service is available for the Pakistan Railways flagship train Green Line Service but is expected to introduce for all passenger trains in the next eight months. This incentive will not only facilitate passengers in booking seats but will also end Black Marketing culture of tickets in Pakistan Railways.